The Department of Computer Science offers a Master of Arts (M.A.) degree in Computer Science, and undergraduate students may also undertake an accelerated B.A./M.A. combined degree program. The Ph.D. Program in Computer Science is based at CUNY Graduate Center and is offered in collaboration with other CUNY colleges. Ph.D. students may be advised by and conduct research with faculty members in the Department of Computer Science at Queens College who have a joint appointment in the doctoral program. Students interested in doctoral studies should consult the Ph.D. Program in Computer Science and CUNY Graduate Center websites for more information. 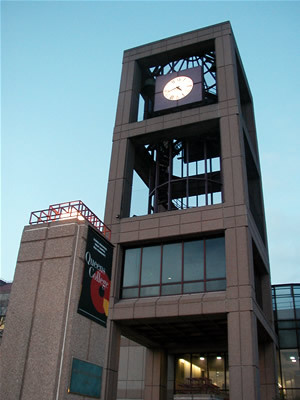 The Chaney-Goodman-Schwerner clock tower of the Rosenthal Library is an iconic feature of the Queens College campus.